During the late nineteenth century the city of Berlin developed such a reputation for lawlessness and sexual licentiousness that it came to be known as the "Whore of Babylon." Out of this reputation for debauchery grew an unusually rich discourse around prostitution. 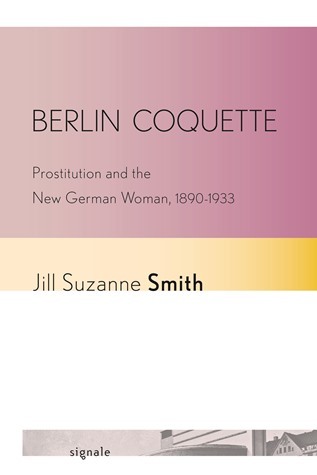 In Berlin Coquette, Jill Suzanne Smith shows how this discourse transcended the usual clichés about prostitutes and actually explored complex visions of alternative moralities or sexual countercultures including the "New Morality" articulated by feminist radicals, lesbian love, and the "New Woman." Combining extensive archival research with close readings of a broad spectrum of texts and images from the late Wilhelmine and Weimar periods, Smith recovers a surprising array of productive discussions about extramarital sexuality, women's financial autonomy, and respectability. She highlights in particular the figure of the cocotte (Kokotte), a specific type of prostitute who capitalized on the illusion of respectable or upstanding womanhood and therefore confounded easy categorization. By exploring the semantic connections between the figure of the cocotte and the act of flirtation (of being coquette), Smith’s work presents flirtation as a type of social interaction through which both prostitutes and non-prostitutes in Imperial and Weimar Berlin could express extramarital sexual desire and agency. Jill Suzanne Smith is Associate Professor of German at Bowdoin College.